Possessed Nazi puppets on a killing spree? 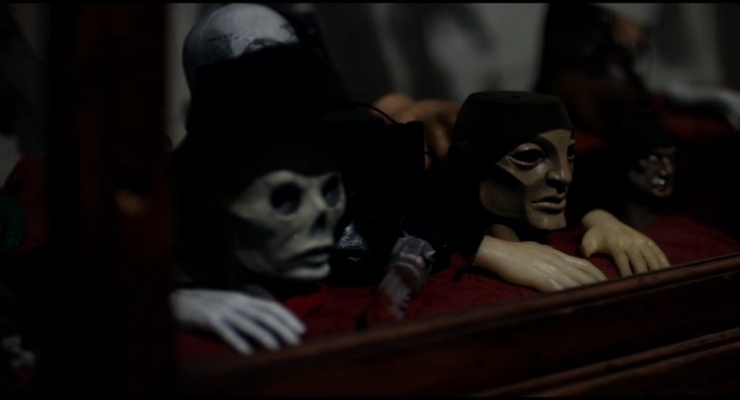 You got it with Puppet Master: The Littlest Reich, the latest entry in this B-Movie cult horror franchise from directors Sonny Laguna and Tommy Wiklund. Recent divorcé Edgar (Thomas Lennon) returns to his childhood hometown and discovers an odd puppet in his deceased brother’s old room. Hoping to make a quick buck, Edgar decides to sell the puppet at auction at a small-town convention celebrating the infamous Toulon murders, and he heads out with his friend and boss Marokowitz (Nelson Franklin) and new girlfriend Ashley (Jenny Pellicer). The gathering soon turns deadly when the attendees’ puppets all become animated and begin to massacre the guests. Fans of this genre of gore horror will find much to love in the insane amounts of blood and inventive kill scenes in Puppet Master: The Littlest Reich, but there is little beyond that to recommend what turns out to be at first a slow and then a very predictable film. There’s one character we get to care about who dies on queue. The idea of possessed Nazi puppets seems scary on paper, but the execution in this film, which I suppose is indeed meant as a comedy/horror film, makes it less scary than farcical. Puppet Master: The Littlest Reich was shot on Red cameras at 2K and brought to 4K Ultra HD Blu-ray in an upscaled HEVC 2160p (4K) encodement. This Ultra HD release is one of the rare releases that does not have HDR (High Dynamic Range), so this is straight 8-bit color, but the finer detail, despite it being upscaled, is a step up from the Blu-ray given the higher bandwidth and more efficient compression on the 4K disc. We really get a clean and impressively crisp image with excellent color and nuance. The Blu-ray is also quite good, with nearly the same level of detail and color, but a very slightly lower level of crispness and a little more noise present in the shadows. Most people may not notice the difference, especially on smaller screens or from farther distances. 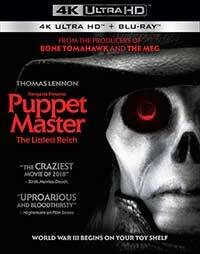 The English DTS-HD Master Audio 5.1 audio mix for Puppet Master: The Littlest Reich is a strong mix with clean dialogue, good dynamics, and solid effects when the chaos starts to ensue. There’s no digital HD included, but there is a standard Blu-ray and small collection of solid ‘making of’ featurettes that prove to be quite interesting. In Puppet Master: The Littlest Reich, the blood flows, the practical effects are among the best for this genre, and it is over-the-top bloody. Some genre fans may love this film, but because of its flaws and limited appeal, others should pass on it. The 4K Ultra HD disc, however, despite a lack of HDR mastering offers a reference quality image and solid lossless 5.1 sound. A divorcé heads to a convention in celebration of the infamous Toulon murders with his friend and new girlfriend to sell his deceased brother's strange puppet and they and the other attendees find themselves being attacked by dolls possessed by an evil Nazi spirit. There is a lot of gore and many inventive kill scenes in this new entry in the Puppet Master franchise, but beyond that it is dull and predictable at times. The 4K Ultra HD disc, despite it's lack of HDR, looks superb.